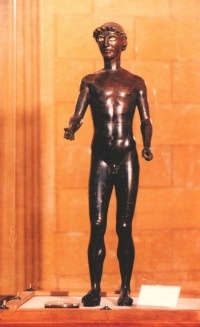 The Ephebe of Selinunte, bronze statue (480-460 BC), depicting a teenager naked, is one of the most striking findings in avventuti archaeological area of Selinunte . Randomly Coming to light in locations Gaggera (near the necropolis) in 1882, is so far the only example of a statue found in the park. The statue was bought by the mayor of Castelvetrano Cav. Giuseppe Saporito Ricca to 500 lire by the rediscovered and is therefore owned by the Municipality. After several events linked to thefts and finds, properly restored, the statue is now finally to < b>Maio Palace library and museum town of Castelvetrano, of which 'Ephebe along with other artefacts and coins Selinunte is the most valuable exposure. Graphically like Actaeon devoured by dogs represented in the famous metopa of Temple E, the statue of a child is 85 cm high and has a sculpture by the characters of a distinctly local, where there is no shortage imperfections. Similar to kouroui sicelioti, Efebo if they separated for lack of consistency and organic in the individual parties and in their relationship. Missing the front of the right foot and is building on the left leg, while the right is slightly flessa forward, it is believed that almost certainly went into the hands of items for worship. Has Doric elements in the composition of the shoulders and head, and penthouses elements in the structure of the body. Some error proportion, especially in the arms, makes it far from typical beauty ideal and by plastic Ancient. He pupils of the eyes vitreous paste and is believed by several parties representing the river Selinos. Curiosity: The statue of Efebo is also called in Sicilian dialect "The young of bridge Galera" for his discovery in this area. 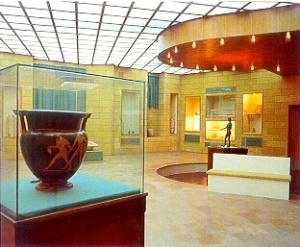 Museum of Castelvetrano. all'Efebo addition, the museum can admire a collection of ceramics and Corinthian Attic, a wonderful crater in red figures, a collection of ancient coins of Selinunte, and a marble statue of the Virgin, the work of Francesco Laurana (after 1466).